Dreamy, well crafted tales of love, deception and all things in between. My first reaction was to recoil slightly as the first three tracks scream ‘Dylanite’ and that’s not a good thing in my book. But; after several more intense listenings I still think Adkins is heavily influenced by His Bobness (Desire period?) but he is far, far from being a one trick pony. Opening tracks Punch Drunk Commotion and A Little Bit of Mercy are Americana folk-rockers of the highest order and put many of Adkins peers to shame. One of my favourite tracks on TROUBLESOME, MY LOVE; Sister, Your Soul Shines is just the right side of creepy to get radio play; but scary enough not to put on a mixtape for your latest girlfriend. As I said; the ghost of Bob Dylan haunts the album but there are hints of Nick Drake, Ian McNabb and even Donovan on tracks like Lady Luck Blues and the awe-inspiring Flesh, Blood and Bone. 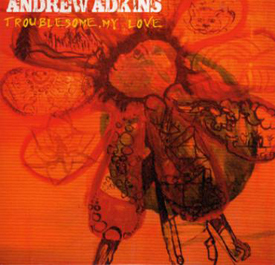 Adkins manages to weave light and shade into most of the songs here and his excellent songwriting is occasionally over shadowed by his own warm voice and enchanting arrangements, leaving the listener dumbfounded at the quality coming out of the speakers. My knowledge of Andrew Adkins is limited, as his bio is nearly non-existent and his website has a fantastic front page but next to no content; so the music will have to speak for him and it speaks highly of a talented singer-songwriter that might just be on the cusp of greatness.